Science fiction fans know how hard it is to get up in the morning after staying up too late reading their favorite sf authors. If only there were some sort of something that could wake you up and make up for lost sleep? Robert Heinlein wrote about it in Methuselah's Children; he called it a sleep surrogate, a little pill that could make up for a short night. Frank Herbert, in his epochal Dune, came up with something a bit more drastic - the wakeshot, an injection that could bring you up from a sound sleep to full salute in seconds. The latest in a long line of fictional aids of this kind is the new product Wake Up On Time, a pill you take before you go to sleep to wake up more alert. Later. Anyway, it contains everything your momma ever told you was necessary for a good night's sleep, including Siberian Ginseng, Guarana Seed Extract and L-Tyrosine. 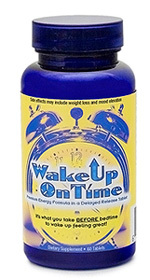 Wake Up On Time tablets are covered with a special coating to delay the release of these potent ingredients until "you need them most - when the alarm clock rings." Speaking personally, I admire the very idea of a coating that knows how long I intend to sleep - six hours or twelve, it works equally well. I think Heinlein used this idea again in The Puppet Masters. Any others?